Home > Finding a Good Dog > Do Dogs Need a Fenced Yard? My opinion is going to make some owners and potential owners unhappy. Nevertheless, it's based on my experience, research, and common sense. Without a fenced yard, you would need to take your dog outside on a leash even for bathroom breaks. That really isn't fair to any dog larger than a Chihuahua. Dogs don't like being tethered to a leash all the time. It is possible, especially with a small dog, to get by with an outdoor exercise pen ("ex-pen"). This is a series of wire panels that unfold into an enclosure where your dog can romp around off-leash. The pen in the photo is far too small, but you can buy several pens and attach them together to construct a much larger space. 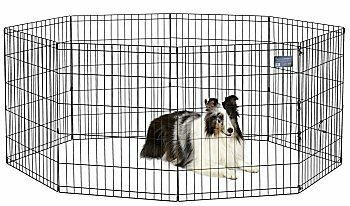 For example, if you type in "Midwest exercise pen" on Amazon, you could buy three of those pens to make a 12 ft by 12 ft enclosure. Four pens would make a 16 ft by 16 ft enclosure. Bigger is better! If you live in a development with a homeowner's association, you'll need to check with them to see if they allow this. It's not permanent fencing, so they might be okay with your leaving it in place. Or they might require you to set it up and take it down each and every time you use it. That wouldn't work so well. Any enclosure should be very, very close to your house. 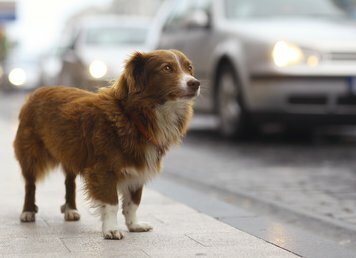 Remember, you will need to let your dog out multiple times a day – in bad weather, too – including very early in the morning and right before bedtime. So it needs to be close to the house. What if there's a dog park nearby? You're not likely to dash to the dog park multiple times a day, especially in bad weather. There are other reasons I don't recommend taking your dog to a dog park, but that's a topic for another article. 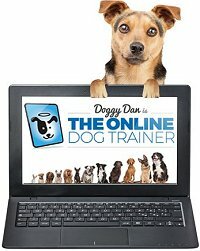 What about "boundary training", where you teach the dog to stay in an unfenced yard? "Boundary training" has cost countless dogs their lives. Dogs have the mentality of a 2- to 4-year-old child and can outrun an Olympic sprinter. The moment your dog is tempted over the boundary – by another dog, a squirrel, a cat – he becomes a loose dog. injured or killed in dog fights. blinded by rocks pegged by bullies. stolen and spirited away forever. shot by the game warden or sheriff for running deer or livestock. poisoned by irate neighbors for pooping on their lawn. Loose dogs also cause accidents. Have you ever swerved sharply to avoid someone else's dog dashing across the street? If by good fortune there wasn't a car coming in the opposite direction, there may be next time. What about electronic or invisible fencing? 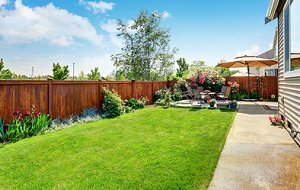 Many homeowners' associations today don't allow you to put up a fenced yard. This is a disastrous policy for those of us who are responsible dog owners. Some associations allow you to install an invisible or electronic fence. You might be wondering, "Does an invisible fence work for dogs? Is it safe?" An invisible/electronic fence is a wire cable that you run underground, all around the perimeter of your property. The wire has a digital radio frequency running through it. If your dog, wearing a special collar, approaches the wire, his collar picks up the radio frequency and emits a warning sound. If the dog keeps going, he receives an electrical shock. I don't recommend these "fences" at all. In my experience, they are neither safe nor secure. 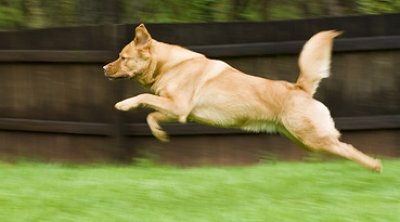 If the motivation is strong enough – say, another dog running past, or a squirrel or cat, even thunder or fireworks – some dogs will dash right across the electrical wire and take the shock, just to get out. At that point, some collars will keep shocking them until they run back into their yard. Unfortunately, dogs can panic at the continuing shock and don't think straight enough to actually make them return to their yard. With nothing to block their view, dogs "confined" by an invisible fence often bark more. They may also charge toward anything they can see, including your neighbors minding their own business in their own yard. If they get too close to the line, the dog may even mis-associate the resulting shock with the neighbor and develop a phobic fear or aggression toward that person. Your dog is completely open to attack by loose dogs passing by. This is especially scary if your own dog is small. This threat alone is enough for me to turn thumbs-down on invisible fencing. A major purpose for fencing is to protect your own dog. Finally, you're wrapping electronics around your dog's neck and hoping it works perfectly. But we all know that electronics can be buggy. A defective collar could repeatedly shock your dog and turn him into a neurotic wreck. If at all possible, I hope you will confine your dog safely and effectively within a physical fence. I talk about fencing options in great detail in my book, 11 Things You Must Do Right To Keep Your Dog Healthy and Happy.